a)	The League shall be named “The West Wales Youth Association Football League” and shall be affiliated to and accept all the Rules of the West Wales Football Association. a)	The League shall provide Association Football for players who are between the age of 16 and under 18 years of age as at midnight on the 31st August in any Season. 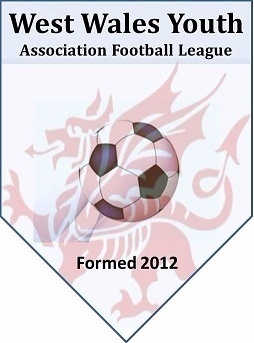 a)	The League shall be the defined area of the West Wales Football Association. The League shall receive into membership any Club affiliated to the West Wales Football Association and shall be divided into Divisions as agreed by the League Management Committee. Clubs from other Area Associations may apply to enter the League. Permission must be received from the relevant Area Association before the entry will be accepted. a)	The Chairman and Vice-Chairman shall be elected by member Clubs at the Annual General Meeting. The Secretary, Registration Secretary, Treasurer, Referee’s Officer and Safeguarding Officer shall be appointed by the League Management Committee. The Management Committee shall consist of up to ten members appointed by the member Clubs. The elected Chairman and Vice-Chairman shall be any of the ten members. b)	The Secretary and Treasurer of the West Wales Football Association shall be ex-officio members of the League Management Committee with full voting rights. The League Management Committee shall be empowered to appoint sub-committees as it deems fit and to delegate all or any of its powers to any sub-committee. A quorum of the League Management Committee shall be five members. A quorum of any sub-committee shall be two-thirds of its members unless otherwise directed. In the event of the voting at any meeting being equal the Chairman shall have the additional casting vote. c)	No resolution shall be rescinded at the meeting at which it has been passed. When any such motion or amendment has been disposed of by the Management Committee it shall not be open to any member to propose a similar motion within a period of six months. d)	The expenses for attendance at League Management and sub-committee meetings shall be determined annually by the League Management Committee and shall be met from League Funds. e)	It shall not be permitted for any Club to have more than one representative serving on the League Management Committee. No registered player or registered Referee active in this league shall serve on the League Management Committee. f)	Any member of the League Management Committee who has been absent from three consecutive meetings without, in the opinion of the League Management Committee, sufficient reason shall be considered to have resigned. g)	The League Funds shall be deposited in the name of the League and all cheques shall be signed by two persons from the Secretary, Registration Secretary, Treasurer and Safeguarding Officer in addition to either the Chairman or Vice-Chairman as the second signatory. a)	A General Meeting shall be held once in each calendar year not later than the second Saturday in July and this meeting shall be called the Annual General Meeting. All other meetings shall be called Extraordinary General Meetings. The Secretary shall, on receipt of a requisition signed by not less than ten Clubs, call an Extraordinary General Meeting at any time for any purpose. Seven clear days notice shall be given to all Clubs for all General Meetings. The Agenda and Balance Sheet, duly audited, shall be available to Clubs at least seven days before the Annual General Meeting. b)	Nomination papers will be forwarded to Clubs not less than fourteen days before the Annual General Meeting and must be returned to the League Secretary seven days before such a meeting. Nomination papers received after that date shall be declared null and void. Each Club in membership of the League shall have the right to nominate one Delegate entitled to vote at every Annual or Extraordinary General Meeting. The following may also vote at all General Meetings:- Chairman, Vice-Chairman and all members of the League Management Committee. No person shall have the right to more than one vote and this must be exercised personally. c)	Clubs seeking re-election or admission to the League may be represented at the Annual General Meeting. Immediately a Club is elected to the League or retains its status under Rule it is entitled to voting rights as a full member of the League. d)	No General Meeting shall have the right to alter a decision of the League Management Committee but, should a General Meeting be against a decision, the League Management Committee shall re-consider its decision. Clubs not represented at any General Meeting shall be dealt with as directed by the League Management Committee.